THEY may be tiny in size but microplastics are becoming a big problem for marine ecosystems, according to UWA Albany researcher Dr Harriet Paterson. Microplastics are microscopic plastic particles ranging from a micron (a fraction of the size of a human hair) to a millimetre, which make their way from washing machines and wastewater into the ocean. 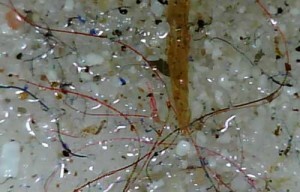 Microplastics are found in micro-beads in cosmetics and tiny threads shed from synthetic clothing during washing. Birds, fish and other marine life easily ingest microplastics, which can cause health problems because it takes many years to break down. Dr Paterson says plastic aquatic pollution is a growing problem. “We keep producing it because our lifestyles rely on it and it keeps getting into the ocean,” she says. Dr Paterson’s citizen science project with the Conservation Council of WA aims to determine microplastics accumulation hotspots along WA’s south-west coast and raise community awareness of the causes and consequences. She has visited seven schools in Walpole, Esperance, Hopetoun, Bremer Bay, South Stirling and Jerramungup to teach students about microplastics marine pollution. Students from each school have visited a local beach, divided into 16 sites, and collected 1kg samples of sand from each section for analysis. 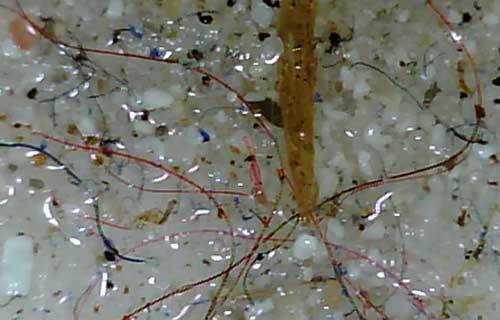 “I’m hoping the same place on each beach has the highest concentration [of microplastics],” Dr Paterson says. Dr Paterson’s preliminary survey results rate Twilight Beach in Esperance as the highest quantity (150) of microplastics, while Cheyne Beach near Albany has the least, with five. After the 112 trial samples have been processed to determine the highest concentration, volunteers will be asked to collect sand from a specific section of 200 beaches between Perth and Esperance. She is keeping a keen eye out for microplastic pellets known as ‘nurdles’, which are used to produce plastic products . Dr Paterson says knowing the plastic’s origin is an important factor to consider when studying microplastic marine pollution. “They are a tell-tale of internationally sourced, virgin plastic,” she says. “Nurdles have been found in sand samples from beaches in Albany and Walpole, where nurdles are not produced. Dr Paterson says people can help prevent microplastic marine pollution by choosing cardboard containers instead of plastic, buying cotton, hemp, wool and bamboo clothes over synthetic fibres and not littering. To contribute to the survey, contact Conservation Council micro-plastics coordinator Kate Born on 0458 204 844.